Andy sends in the photo below, taken in warmer times in the vicinity of Jamestown, New York. I’ve got 2 copies of the 2012 Amish Woodworkers of America guide for the 2 best captions. This latest edition of the guide includes a short piece I wrote on Amish furniture businesses. Ma and Pa are draggin’ the Winnebago…. The Amish Navy prepares for action. AMISH NUN ON THE GO! Sister is on her way to do ministry in the city. It’s one of those all in one units. The real trick is getting the horse harnessed up to the boat and into the lake once you get there. Go Ahead…Bring on the hailstorm. We enjoy gettin’ away too! What is everybody looking at! Hahahaha!! This one made me laugh out loud! Sorry Emanual I couldn’t find the umbrella we are gonna have to use the boat for shade. We are ready for Sandy- flip us over and we are an Ark! A fishin we shall go! 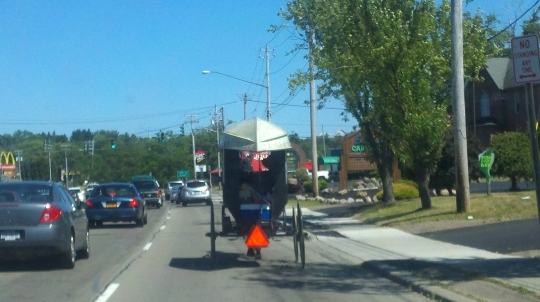 DOT Laws apply to Amish too. Logged too many horse hours this week. Its time for the Boat! gone clamming. A fun time that dosen’t cost any money. Daniel, I knew you should have turned left at that last corner. This isn’t the way to the lake! I vote for the two captions which feature Hurricane Sandy. Very topical today. complete with a one horsepower motor. Are you sure this is enough boat to float the buggy after the hurricane gets here? The Amish version of dressing up for Trick Or Treating. It’s no ark, be we like to call it home. Is that Andy in back of us taking our picture? Oh No! Erik is going to put us in his contest! Jacob went to vote. He had heard that if he did vote he would be up a creek with his bishop. At least we didn’t put our dog on the top, like some English seem to do. The Lord is not only my shepherd and my co-pilot, He is also the Captain of my ship. Lot of good captions here 🙂 I didn’t even think of the potential Hurricane Sandy associations when I put it in. Hope that water doesn’t get too high for folks in the path. I feel compelled to ask if all the readers of Amish America are alright and not negatively impacted by “Hurricane Sandy?” I hope everyone is safe, dry and well.